You have to check this out. 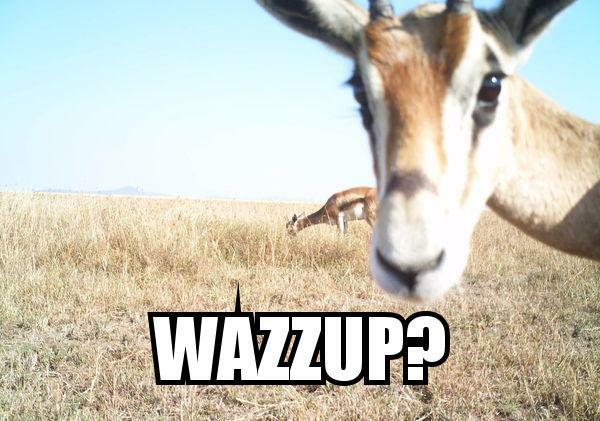 Zooniverse has put together a hilarious web site called Save the Memes. It’s a light-hearted way of spreading the story about our Save Snapshot Serengeti campaign. And while it’s good for that… it’s perhaps a little distracting for us scientists, too! Give it a go with some pre-selected images. 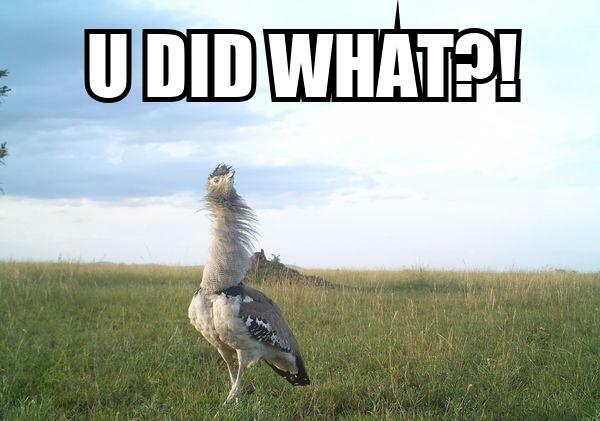 Or, you can turn your favorite Snapshot Serengeti image into a meme from the Talk pages now using the “Meme This!” button. 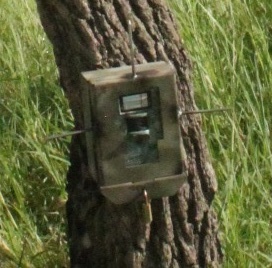 Calling all camera trap captures! BBC’s annual camera-trap ‘photo of the year’ contest is drawing a close – and we’re pretty sure Snapshot Serengeti has some winners. So we’re asking for your help to find them! 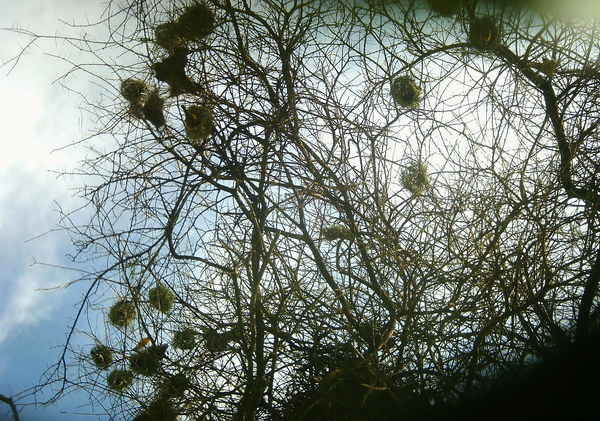 Animal Behaviour Images captured during the course of research that show interesting or unusual behaviour. New Discoveries Images that show something new to science, such as a species never before photographed in the wild or outside its known range, or behaviour never before recorded. The caption must make clear what the discovery is. …but we’d like your help to find some more! 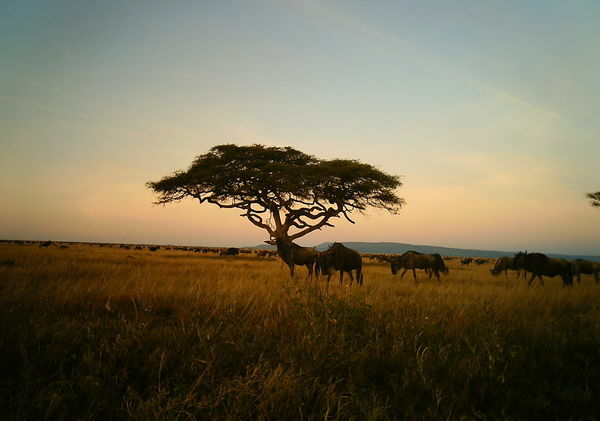 So send us the subject ID’s or urls of your all-time favorite Snapshot Serengeti pics (via comments here). One of them just might wind up front and center in the next issue of BBC Wildlife or make Snapshot Serengeti the proud winner of a monetary prize to keep the cameras clicking. And speaking of Snapshot Serengeti funding, I wanted to take a minute to say thank you all who have supported our Save Snapshot Serengeti campaign so far. Yesterday we passed our 20% mark, and we’re marching forward! For everyone out there who loves looking at these incredible photos, please take a look at our campaign — we have some really fun perks that you might enjoy. And whether or not you’re able to make a donation, please help us spread news of the campaign by sharing our link: igg.me/at/serengeti — the more people we reach, the better our chances of bringing you these photos for years to come. 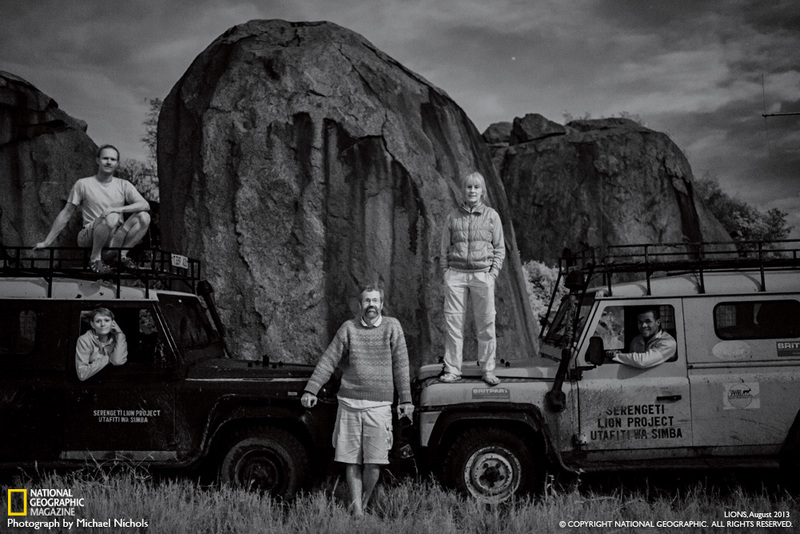 Thank you for your support, your effort, and for being as addicted to Snapshot Serengeti as we are! 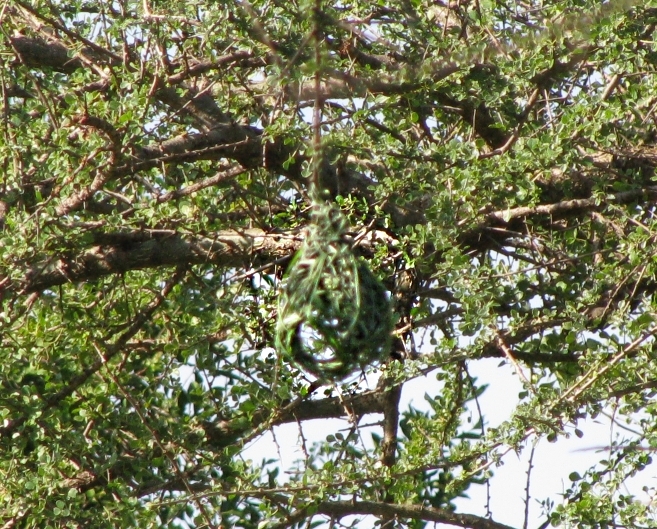 Season 6: Snapshot Serengeti’s Final Season? 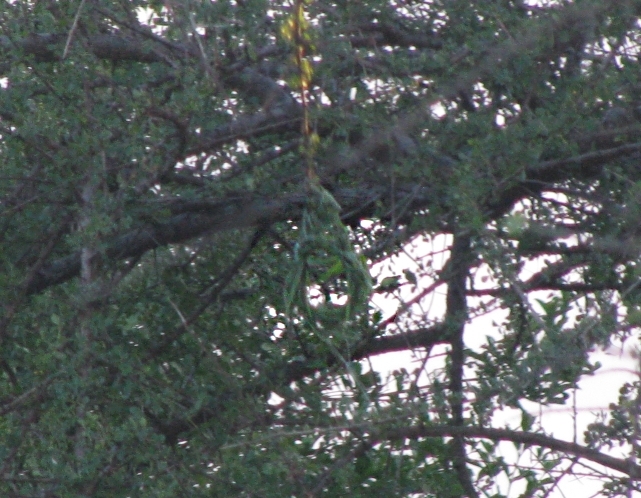 Spikes make the cameras less palatable…I hope…. and Daniel found and collared the long-lost Transect Steady pride. And, although Season 6 marks my last field season as a graduate student, we on the Snapshot Serengeti team want to keep the cameras running for as long as we can. 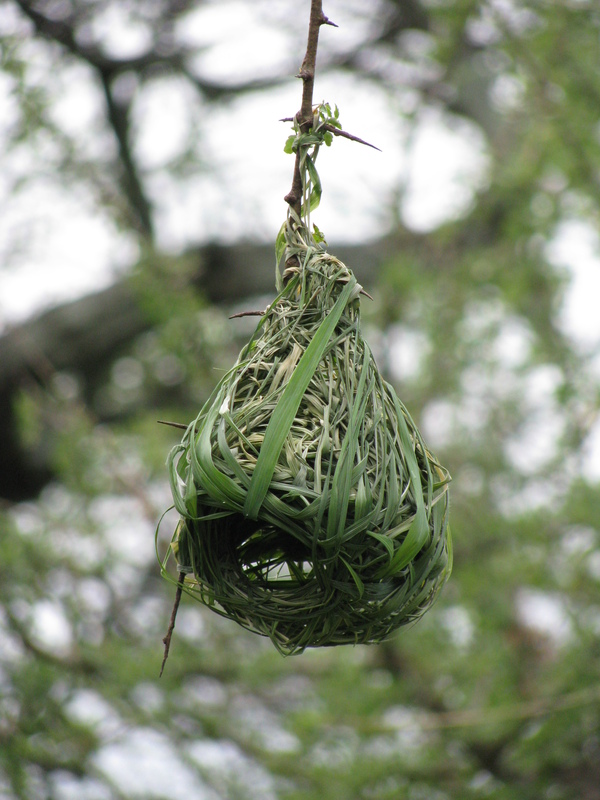 There is still so much to learn about the Serengeti, and many of its secrets can only be understood by long-term projects that capture both annual variability and unexpected events. 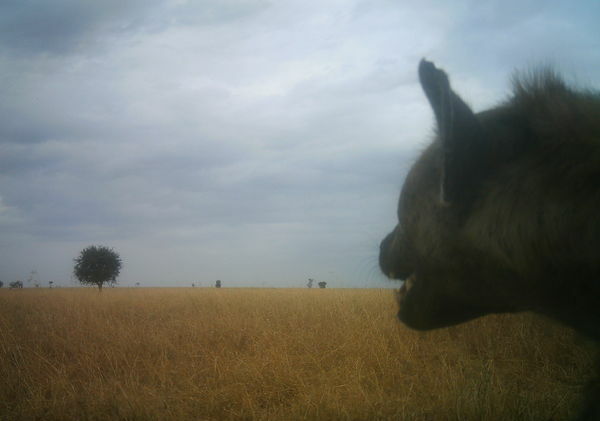 The Snapshot Serengeti cameras let us study this incredibly dynamic system in a way that was never possible before – and we’re not ready to stop. But we need your help. Our NSF funding has run out, and unless we raise enough money to keep the team going, there won’t be a Season 7. So we’ve launched a crowd funding campaign on Indiegogo to meet our immediate funding needs. And we’re asking for support in any way you can give. We’ve got some fun “perks” in return for your donations, but the biggest perk of all will be having a Season 7 to look forward to. So, if you too are addicted to pressing ‘play’ on the silly warthog close-ups or collecting images of baboon selfies, please share this campaign with your friends and family. The more people we reach, the better our chances of meeting our goal and keeping our cameras running…and the better our chances of truly understanding what makes this incredible ecosystem work. I recently returned from Serengeti with all of my limbs intact and hard drives full of camera photos in tow. The images on these drives comprise Season 6 – the season I welded spiky nails to the cases to discourage hungry hyenas from chomping on them, didn’t get stuck every 3 days for a change, and also my last trip as a Ph.D. student. (Now I’m back in Minnesota trying to make sense of all the data and write my dissertation!) The Season 6 images are slowly making their way through the cloud to the Zooniverse team, and we’re expecting to have them online by the end of the month. Unfortunately, things are not all butterflies and rainbows for us. In fact, Season 6 will mark a rather dire situation for Snapshot Serengeti. As Margaret wrote back in May, our National Science Foundation funding has run out – and our application for renewed funding was rejected. Unless we raise enough money to keep our Land Rovers limping along, our cameras will turn off, and we’ll lose our secret window into this incredible world. The good news is that we have a plan. Today we launched a crowdfunding campaign on Indiegogo, our first step in keeping the project going. 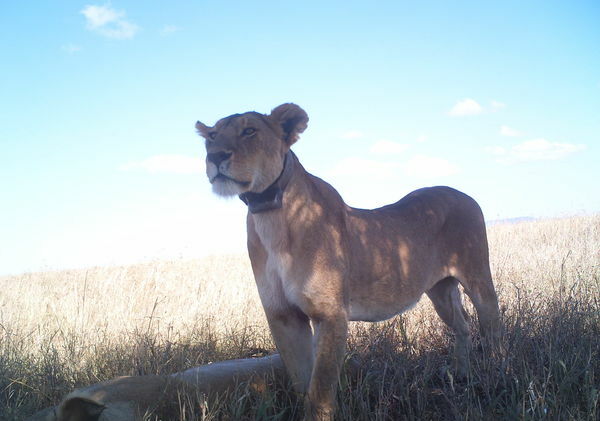 We are asking people around the world to help us raise money to keep the Snapshot Serengeti cameras clicking for another three months after our funding ends in September. That will get us to the end of the year and give us a Season 7. And meanwhile, happy hunting in Season 5. Thanks! Lions, cheetahs, and dogs, oh my! Part 2. 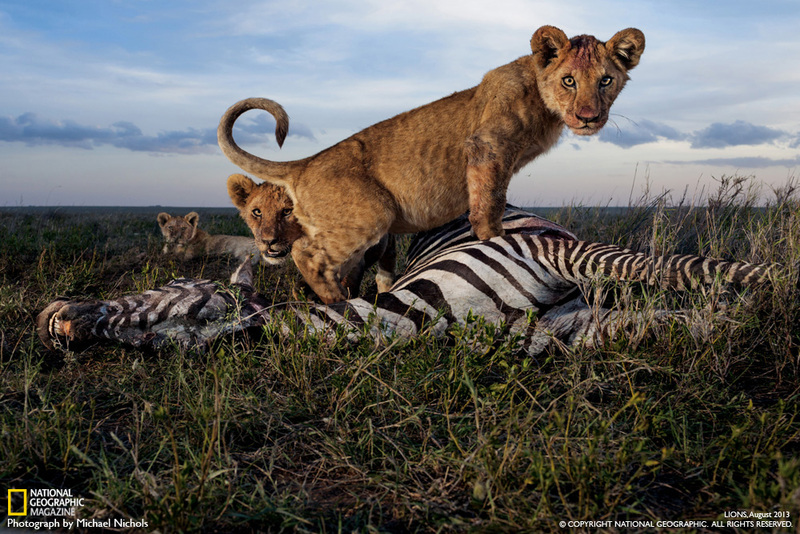 Last week, we left off with this crazy biological paradox: lions kill cheetah cubs left and right, yet as the Serengeti lion population tripled over the last 40 years, cheetah numbers remained stable. As crazy as it sounds, it seems that that even though lions kill cheetah cubs left and right, it doesn’t really matter for cheetah populations. There are a number of reasons this could be. For example, cheetahs are able to have cubs again really quickly after they lose a litter, so it doesn’t take long to “replace” those lost cubs. It’s also possible that lions might only be killing cubs that would probably die from another source – say, cubs that would otherwise have died from starvation, or cubs that might have been killed by hyenas. Whatever the reason, what we’re seeing is that lions killing cheetah cubs doesn’t have an effect on the total number of cheetahs in the area. I think this might hold true for other animals, not just cheetahs. It’s a bit of a weird concept to wrap your head around – that being killed, which is really bad if you’re that individual cheetah, doesn’t actually matter as much for the larger population – but it’s one that seems to be gaining traction among ecologists who study how different species live together in the natural world. Specifically, ecologists are getting excited about the role that behavior plays in driving population dynamics. 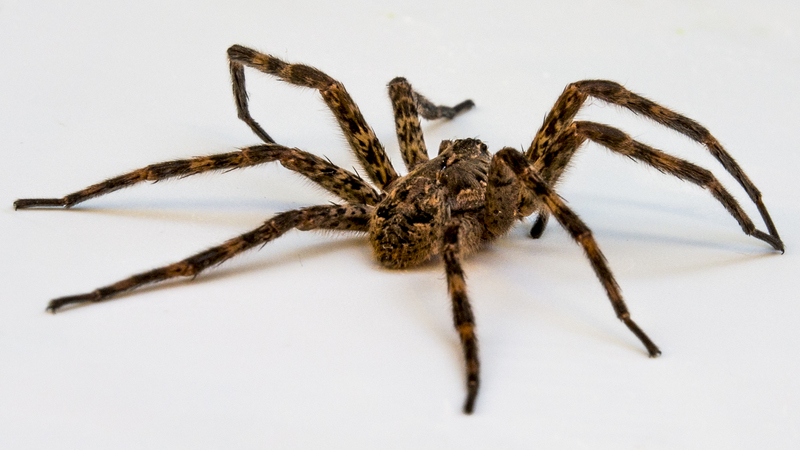 Most scientists have studied this phenomenon in predator-prey systems – say, wolves and elk, or wolf spiders and “leaf bugs”. Wolf spider. Photo from Wikipedia.org. “Leaf bug” from the Miridae family. Photo from Wikipedia.org. What scientists are discovering is that predators can suppress prey populations not by eating lots of prey, but by causing the prey to change their behavior. Unlike many spiders, wolf spiders actively hunt their prey – sometimes lurking in ambush, other times chasing their prey for some distance. 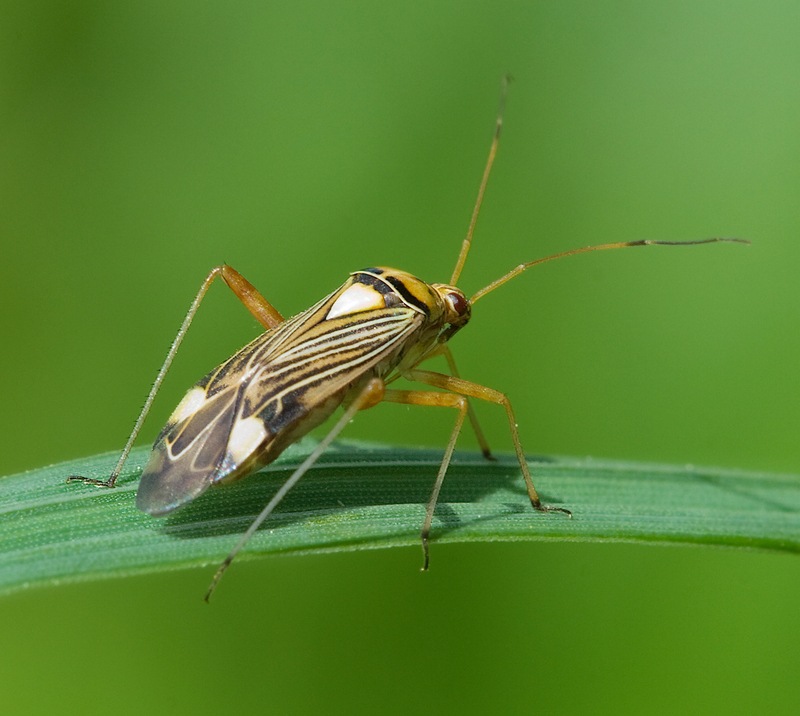 To avoid being eaten, leaf bugs may avoid areas where wolf spiders have lots of hiding places from which to stage an ambush, or leaf bugs may avoid entire patches of land that have lots of wolf spiders. If these areas are the same ones that have lots of mirid bug food, then they’ve effectively lost their habitat. Sound familiar? 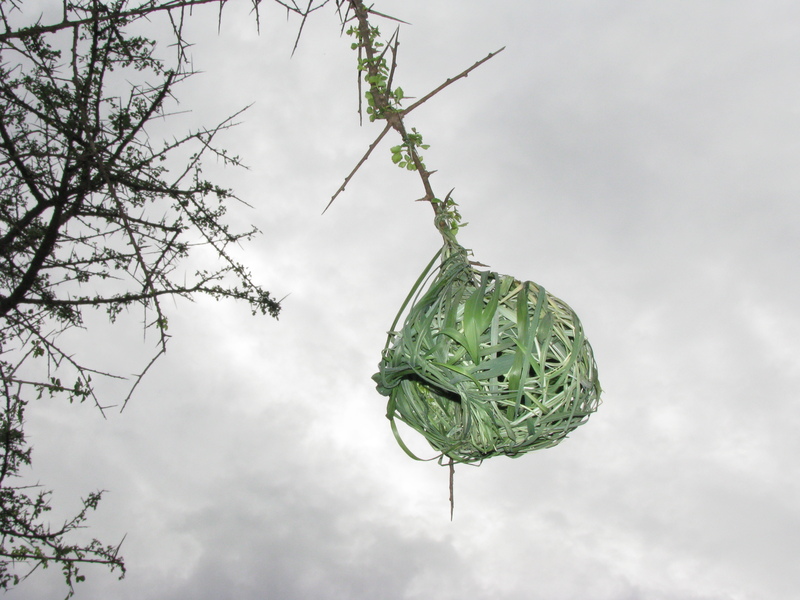 Back to Africa – what does this mean for wild dogs and cheetahs? Interestingly enough, lions do not displace cheetahs from large areas of the Serengeti. We’ve discovered this in part from historic radio-collar data that was collected simultaneously on both species in the late 1980’s. Below is a map that shows average lion density across the study area. Green indicates areas with higher densities. The black “+” symbols show where cheetah were tracked within the same study area. 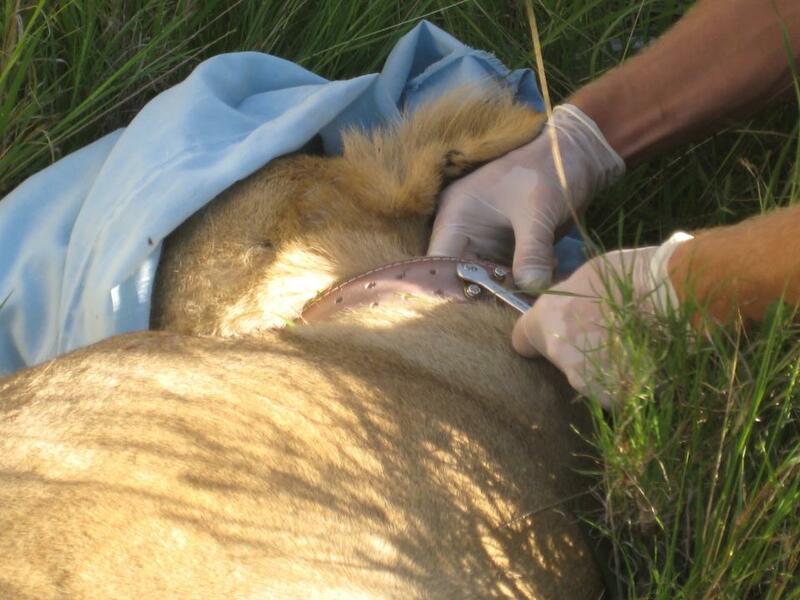 They are overwhelmingly more likely to be found in areas with lots of lions. This is because that is where the food is – and cheetahs are following their prey, regardless of the risk of encountering a lion. 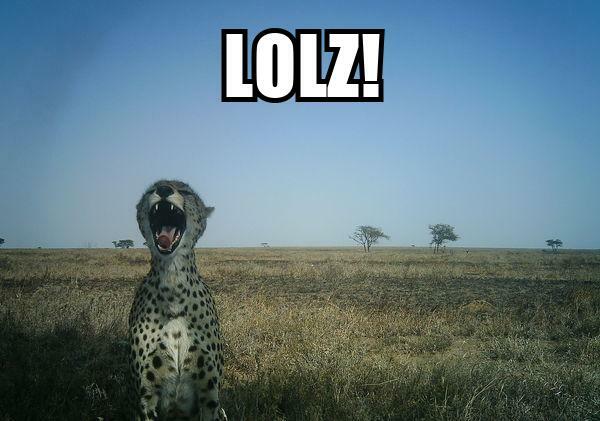 The Snapshot Serengeti data confirm this – cheetahs are way more likely to be caught on cameras inside lion territories. Lion density is mapped per 1km x 1km grid cell. High density areas shown in green, lower in pale orange/gray. Cheetah locations are the black +’s. 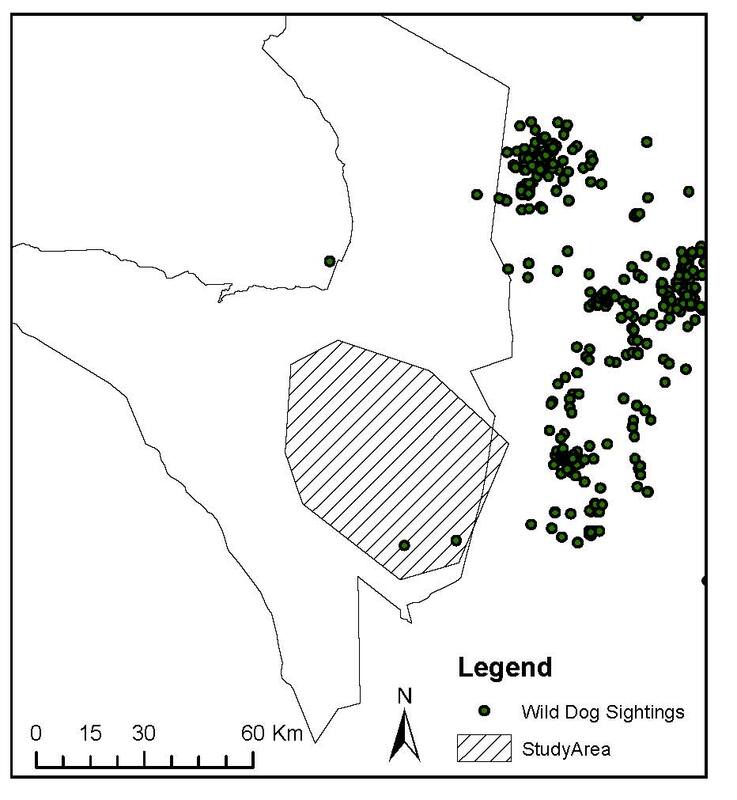 Unfortunately, we don’t have radio-collar data on the Serengeti wild dogs from the 1980’s. But we do have radio-collar data for the wild dogs that have been living in the larger Serengeti ecosystem for the past 8 years. 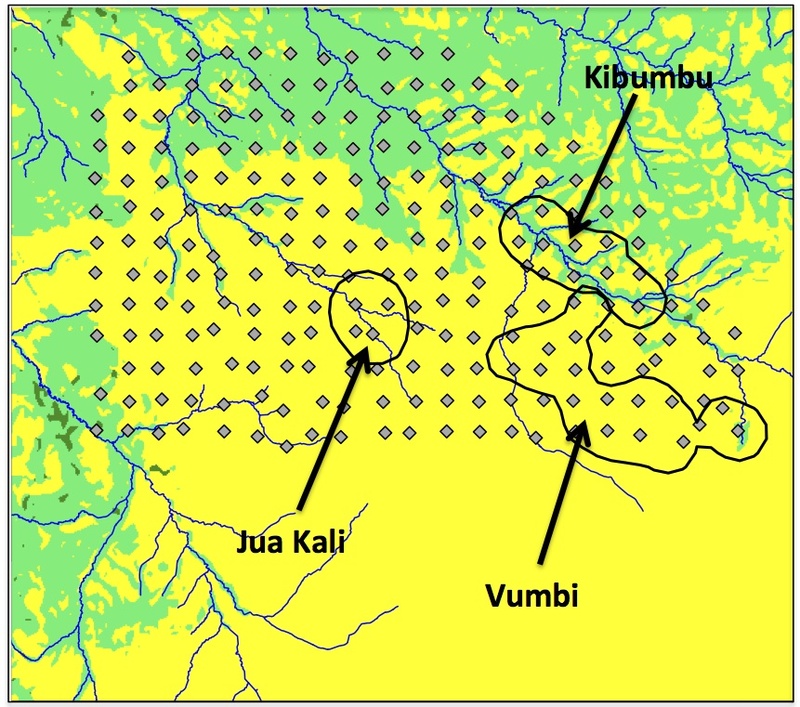 As you can see in the map below, wild dogs regularly roam within just 30km of the lion study area. But they don’t settle there – instead, wild dogs remain in hills to the east of Serengeti – where there are local people (who kill wild dogs), but very few lions. 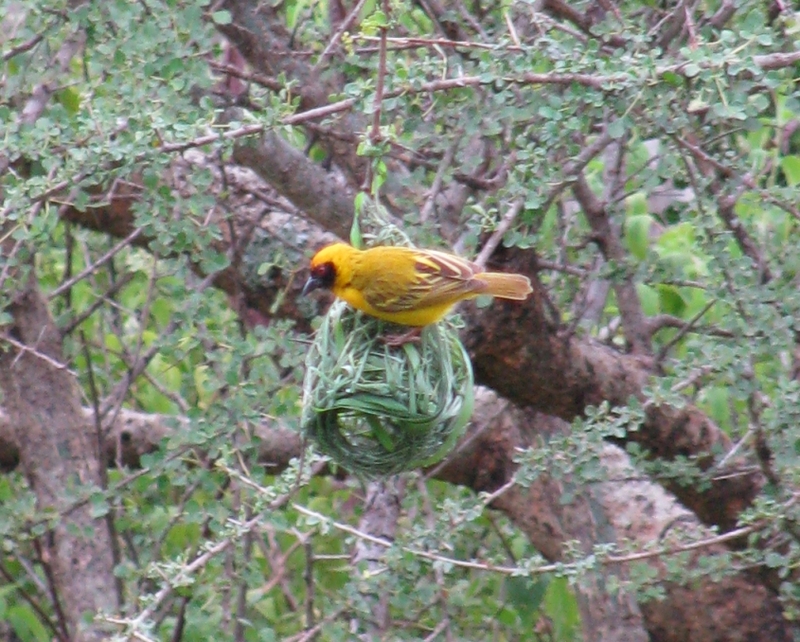 Other researchers in east and southern Africa are starting to pick up on the same patterns in their parks. From Tanzania, to Botswana, to South Africa, researchers are finding that wild dogs get kicked out of really large, prime areas by lions…but that cheetahs do not. What they’re finding (since they have all these animals GPS-collared) is that cheetahs are responding to lions at a very immediate scale. Instead of avoiding habitats that have lions, cheetahs maintain a “safe” distance from the lions – allowing them to use their preferred habitats, but still minimize their risk of getting attacked. Carnivore researchers are only really just beginning to explore the role of behavior in driving population-level suppression, but I think that there’s good reason to believe that large scale displacement, or other behaviors, for that matter, have greater effects on population numbers of cheetahs and wild dogs, as well as other “subordinate” carnivores – not just in African ecosystems but in systems around the world. It’s a new way of thinking about how competing species all live together in one place, but it’s one that might change the way we approach carnivore conservation for threatened species.